Uncharted: The Lost Legacy Hidden Trophies - what are they, and how do you unlock them? 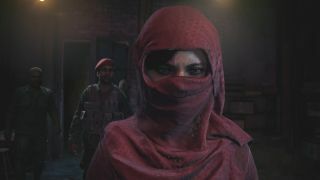 Chloe and Nadine are back in Uncharted: The Lost Legacy, embarking on a new adventure and, of course, bringing a fresh set of shiny pots to collect. Within them are 21 hidden trophies, which can be unlocked by completing certain feats or finding the relevant collectible items. We've listed the details of every secret award here, along with hints and tips on how to earn them all. This basically means beginning a new game and getting all the way to the start of Chapter 5 without using any weapons. Make sure you start a new game and don't carry over any stats or Treasures - we recommend playing on Explorer difficulty take make things easier. Ignore any weapons in Chapters 3 and 4, and instead use only stealth takedowns and melee attacks on any enemies you encounter. Enemies shot by Nadine will not void your progress. There are a total of 17 Optional Conversations to have during the game, which are one of the main collectibles. For all of their locations, check out our Uncharted: The Lost Legacy collectibles guide - Treasures, Photo Opportunities, Lockboxes, and Optional Conversations. There are four zip-lines in total - you should use one early in the chapter, and two more should be found automatically during the escape sequence at the end. This leaves one more to collect, which can be found just after the fist fight with three enemies. Make sure you go straight ahead when you land on the next rooftop and jump to the neon signs, then on the next rooftop take the left-hand route through the clotheslines to find the zip-line. When you slide down the final line to end the chapter the trophy will unlock. When you attach the winch to the gate you'll get ambushed, giving you the first chance to fire your weapon. Get down to your last bullet, then finish off an enemy with it (a headshot works best) to unlock this trophy. For this trophy you need to defeat four enemies in 20 seconds with the jeep. When you encounter the large group of enemies, knock down the first two in the water then drive up the slope ahead and try to hit two more on the upper level. If you don't manage to find four in the time limit then restart the encounter and have another attempt. Restarting this encounter, take out the enemies in the lower flooded area and pick off the ones you can see up in the ruins, then enter cover out of sight of the remaining enemies and wait until you re-enter stealth. The first Lock Box can be found in the same area, meaning two additional hidden trophies can be earned here. If you leave at least one nearby enemy alive while opening it you'll receive I Was Never Here, and if you pick the lock in under 15 seconds you'll also get Fingersmith - if you find the first couple of pins are taking too long then back out and start again to reset the timer. For this trophy, just drive the jeep straight off the cliff in the opening area. If you want to get this trophy out of the way now, keep looping around over the ramps in the opening area until it pops. Locate the Hoysala Tower and climb up it to reach the main chamber, then open all the doors to update your map. Now, climb around the broken door looking out towards the mountain and continue upwards until you reach the top of the tower, then wait for Chloe to finish all her dialogue and start performing some yoga poses. Head to the question mark in the northeast of the map and investigate the White Monkey Temple there to begin a side quest tracking down Hoysala Tokens. You'll need to find all 11 of these to access some of the Treasures in this chapter, so check out our Uncharted: The Lost Legacy Hoysala Tokens location and puzzle solutions guide to grab them and unlock these two hidden trophies. Once you've activated the mechanism and escaped to the top of the dam, jump into the water - if you turn around and walk a bit further along, there's a pool where you won't be swept along by the current. When you come up against the APC, you need to plant enough C4 charges on it to destroy the vehicle with one detonation. The number of charges required varies depending on their placement and your difficulty level, but four was enough for us on Moderate. Use the long grass to sneak around the area gathering C4 from the open crates, then throw them onto the APC and detonate once they're all primed. If you don't destroy it first time, choose Restart Encounter for another attempt. Slide down the upper waterfall slope but jump left to grab the wall before the end, then climb up to the platform above. Now jump down into the pool below to perform a cannonball. At the rope grapple point near the railway bridge, swing out then turn around and jump to the ledge below where you started. The Strange Skull you collect here turns out to be a Skeleseer toy - examine it from the Treasures menu then rotate it to see your fortune underneath. This is a reference to an item found in The Last of Us: Left Behind. For this challenge you need to destroy the helicopter without defeating anyone. While it's possible to do this legitimately, it's much easier to revisit this fight from the Encounter Select menu after completing the game, then use the Bonus > Weapons menu to equip an RPG. Give the helicopter a couple of quick blasts then drop down and grapple it as it flies past for an easy win. When the jeeps start driving alongside the train, throw a grenade to land inside one and destroy it. If you're having trouble hitting the target, try turning on Lock-on Aim in the Controls menu.